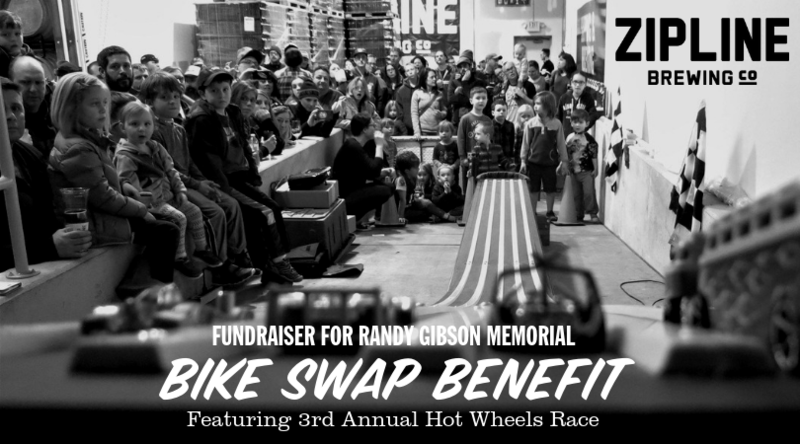 Bike Swap Benefit and Hot Wheels Race - Brewery Taproom - Zipline Brewing Co.
WHAT: Bike Swap Benefit is a free admission multi-layered and all-ages event to raise cash through exhibitor fees, silent auctions, and Hot Wheels races to help the family of Randy Gibson fund a memorial bench in his honor. Further funds raised will go towards a shelter on the Homestead Trail, south of Lincoln. 4:30ish Hot Wheels Racing Begins! BIKE SWAP: Here is your chance at great deals on new and used bikes, bike components, clothing, and everything else bike related… or not bike related. BEER: Zipline will be pouring their fine award winning ales in both the exhibitor/brewery area, as well as in the taproom. FOOD: Who better to feed a hungry group of bicycle lovers than Pepe’s Bistro? Pepe will be serving up delicious vegetarian delights! HOT WHEELS RACE: Our all-ages Hot Wheels race will be a showdown to see who’s car is the fastest in town. It all takes place on our lightening fast custom made Shear Composites race track. **IMPORTANT** Competitor cars must be new in box (NIB) to be opened at the event. Entry fees will be $5 per car. Loads of great prizes for winners, and all the proceeds go to the benefit.